Monrovia, Liberia: The President of the Republic, His Excellency Dr. George Manneh Weah, has made yet another giant move in fulfilling one of his campaign promises, breaking grounds for the construction of a modern state-of-the-art market structure in the Omega Community, Paynesville. During the 2017 campaign, the then Coalition for Democratic Change Standard Bearer drew enormous support from ordinary Liberians, most of them marketers and peddlers whom he promised to help in making relevant actors in the economy and by improving environments in which they make business. Taking peddlers and ‘yana boys’ out of the streets and placing them in modern market buildings was one of the President’s campaign promises. On Friday, March 29, 2019, the Liberian Leader planted the seed of fulfillment of that promise when he broke grounds for what to be called “14th Gorbachev International Market”—a US$3.8 million Project funded by the Government of Japan. It is being implemented by the Liberian Agency for Community Empowerment (LACE). If completed, the modern market will house four thousand marketers and bring to an end their ordeal of selling their wares under unfavorable considerations that endanger their health, safety and their goods. Speaking during the groundbreaking ceremony, President Weah termed the construction of the market a continuation of the fulfillment of promises he made to ordinary Liberians, mainly marketers during the 2017 election campaign. The Liberian President said he had long empathized with Liberian marketers who make ends meet selling in scourging sun and under harsh raining conditions without a better place to transact their businesses. President Weah, who lived in some of the world’s beautiful cities during his football career, said he had been touched by the beautiful structural outlooks and serenities of those citizens and feels determined to transform Liberia and bring it on par with those cities. “I want to bring home to my country what I saw abroad, for instance, like Monte Carlo,” he said, emphasizing that the construction of the market indicates the sustained efforts he is exerting since his ascendancy consistent with his long-held plan to change the country into the Monte Carlo of Africa. The Liberian Leader used the ceremony to also hail the exemplary support of the Government of Japan to the government and people of Liberia in many areas of development, including the construction of roads and housing units in different parts of the country. 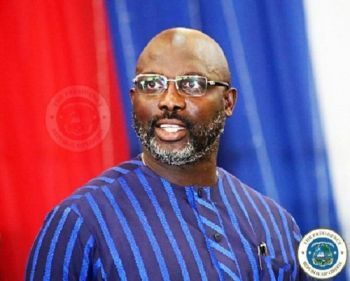 In a related development, President Weah has announced government’s plans to provide 10 acres of land to the Transport Union of Liberia to build a modern transit facility. He assured the young people of Liberia, most of them in the transport sector, of his government’s continuous commitment and support to improving their situation. He mandated the Minister of Foreign Affairs to use his good offices to attract support from partners for the construction of a modern headquarters for the Transport Union. The President bragged about what his government has been able to achieve in a short period of time. Dr. Weah said since the founding of Liberia in 1847, he is the first to begin actual work in line with his agenda before launching it. That was in difference reference to the multiple pro-poor projects his government had embarked upon and in some cases completed before the launch of the official development plan called the Pro-Poor Agenda for Prosperity and Development. The 14th Gorbachev International Market being constructed by BM Construction Company is expected to contain distinct compartments for the sale of different food stuffs and other goods, including car park.